The latest research from Horowitz Research’s Multiplatform Content & Services report shows that over-the-top streaming video on demand (OTT SVOD) services remain a complement to, not a replacement for, traditional pay TV: 40% of Internet users have multichannel and an OTT SVOD service, 42% have multichannel only, 11% have an OTT SVOD service only, and 7% have neither. Among OTT SVOD users, 78% are also multichannel subscribers. But recent OTT developments from traditional pay TV distributors—DISH’s Sling TV and DirecTV’s Yaveo—could start changing the game. “For many, streaming video has become an integral part of the viewing lifestyle. The idea of an Internet TV service, at a lower price point and with more customizable options, is an attractive prospect,” says Adriana Waterston, Horowitz’s SVP of Insights and Strategy. 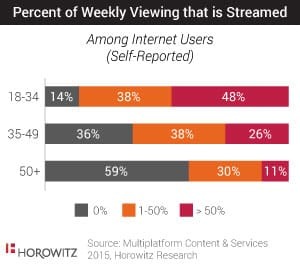 The study finds that among Internet users overall, 51% have access to an OTT SVOD service (i.e., Netflix, Hulu paid, or Amazon Prime Instant Video), rising to 75% among Millennials. In fact, Millennials are three times as likely to have an OTT SVOD service and no multichannel (21% among Millennials, vs. just 7% among 35+) and nearly half (48%) report spending more than 50% of their viewing time streaming. Furthermore, fifty-five percent (55%) of Millennials who are multichannel subscribers say that if the price were right, they would subscribe to an Internet TV service instead of their current cable or satellite service, compared to 43% of 35+. “For Millennials, streaming is as natural as turning on the TV set, so an OTT service direct from a distributor could be a natural fit,” says Waterston. “No longer tied to their physical infrastructure, OTT offerings have the potential to offer huge opportunity for distributors to reach beyond their footprint, shaking up the entire pay TV model,” Waterston adds. 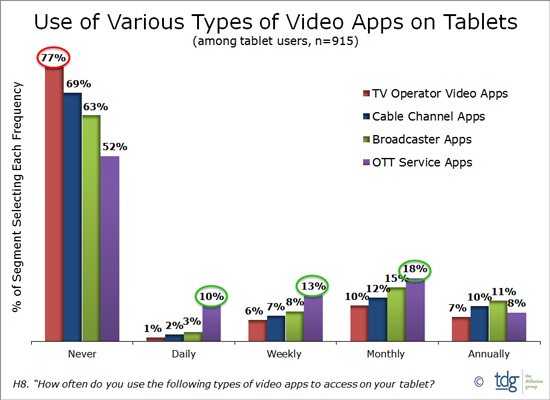 Multiplatform Content & Services is a syndicated consumer survey focusing on video consumption across all platforms. The survey was conducted online by Horowitz Research in May 2015 among 1,568 broadband Internet users 18+.